Which Would Make it Mail Fraud, No? Ted Cruz’s campaign is under fire for a mailer it sent out in Iowa that is designed to look like an official government document. The mailers tell the recipients they have a “voting violation” for failing to caucus in previous elections, and grades them on an A to F basis, Politico reports. The paper has the words “official public record at the top,” and also includes actual names of the recipients neighbors. That may work in Calgary, Rafael, but in Iowa…. You Mean As Opposed to Selling Out Your Own Kind for Your Own Personal Financial Benefit? …the only real m.o. of Log Cabin Republicans, the apparent concocters of this fake (as the non-endorsement at the end of the ad demonstrates) ad for Bernie Sanders? On LGBT rights, Hillary Clinton has led from behind. Log Cabin giving a flip about T rights? No, I don’t trust HRC’s HRC but I do know two things: (1) She’s not going to allow anyone or anything to get in her way this time; and (2) no matter what, I’ll trust HRC’s HRC more than I will ever trust Jews for Hitler for Mice for Cats Log Cabin. For many years I presumed it had been authored by Brewster and/or one of the other folks directly involved with Drag. A little over two years ago I ran across the original source of the text that appeared in that issue of Drag. 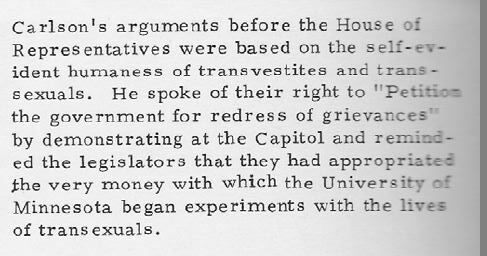 Under a slightly different headline (“Equal Rights for Transexuals, Transvestites”) it was an article that appeared in the February 5, 1976 issue of the Minnesota Daily, the University of Minnesota’s newspaper. And it had a byline. The author was Tim Campbell. He died in December at the age of 76. There are several obituaries for him out in internet-land, but I’ll link only to the one in Lavender magazine. But there is one other thing I hope folks will remember even if he did not want to focus on it. He wasn’t just one of the early pro-marriage folks. And he wasn’t just the publisher, throughout the 1980s, of the GLC Voice newspaper. He also played a key role in bringing forth the trans-inclusive language that he wrote of in that Drag / Minnesota Daily piece. 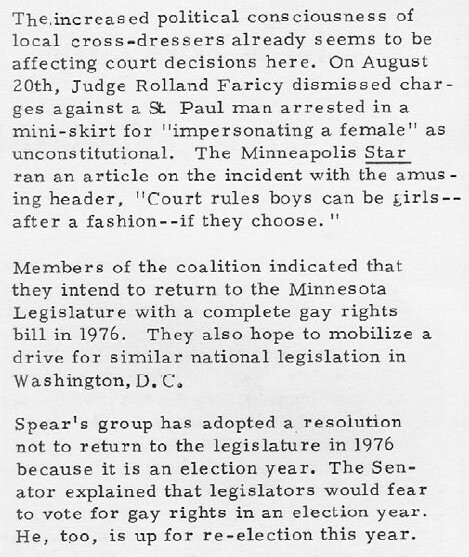 Allan Spear, who Campbell did not think very highly of, did eventually begin introducing trans-inclusive legislation in Minnesota and was the Senate author of the bill that in 1993 became the first statewide trans-inclusive civil rights law. But that wouldn’t have happened without the agitation at the state legislature in 1975 – which led to much in the way of hard feelings between the inclusionists and the incrementalists but also led to the trans-inclusion language being added to the then-gay-only Minneapolis Civil Rights Ordinance. The fortieth anniversary of that occurred four days after Campbell’s death on Dec. 26. A bill that would provide some protections for lesbians, gays and bisexuals – but not for transgender Hoosiers – squeaked out of an Indiana Senate committee Wednesday night. …and there damn sure should be no such thing as a gay-only rights bill that is not being actively opposed by each and every tentacle of Gay, Inc. If it is a gay-only rights bill, it deserves to fail. If it is a gay-only rights bill, it must be opposed. If it is a gay-only rights bill and you are for it, then you are the enemy. 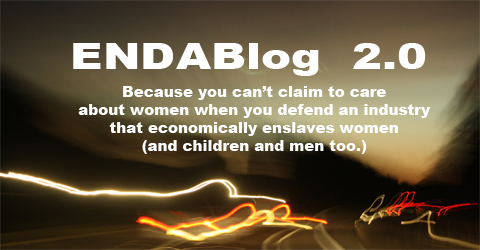 The Outstanding Blog category has been eliminated from the newly announced GLAAD Media Awards, and along with it the grassroots first-person voices of writers across the entire LGBT spectrum…. Additionally, the award for “Most Obnoxious, Clueless, Millionaire Media-Based Insta-Transitioner” will go on as planned. Hoping That Trump Supporters OD on Dirty Pair and Urusei Yatsura Instead of Voting? That would appear to be the establishment Republican strategy. While explaining that he believes that Donald Trump’s success in the Republican party does not mean that establishment conservatism is dying, GOP strategist Rick Wilson dismissed the “childless single men” who support Trump’s presidential bid. Fujiko Mine could not be reached for comment. It wasn’t all that long ago that the phrase “childless single men” was a dogwhistle equating to “gay.” So, I wonder if we haven’t seen anything yet from the establishment Republicans. But I will say that HRC continues to be a fistula on the body of LGBT civil rights.